Alright before diving into the meat and potatoes of this post, well in the case of the crazy vegetarians out there like me. The Facon and Potatoes of this blog post, I will start with the hardest what you should know. Did you know it is really hard for me to consistently match the titles and how I did the titles up to this weeks blog week? I don't think I have hit the same format once yet. Could I fix them? Yes. Should I fix them? Probably. Will I fix them?? Nope. Why?? LAZY!!!!! So today's prompt from Karen was a good one. I start this post off with a side comment almost a pre-disclosure, disclosure. However, since I rarely take those things all that seriously I am not going to claim it is a disclosure. How about a point of interest. I had some ideas as to where I was planning on taking this post. Many ideas. I had resolved myself that I was not going to look at what anyone else had written until I wrote my own stuff for fear of corruption or ideas sneaking into my head. I failed at that. I read a bunch of #dblogs once I got my internet back. I was just so happy to have it back, I forgot my resolution. FAIL. I am not intentionally taking anything from you, yet if I do not attribute an idea that you feel is YOURS, it is not intentional. You corrupted my thought patterns and well yeah. The other tidbit is I am going to try to keep sarcasm to a minimum.... I mean my sarcasm in check... I mean I won't be making fun of someone at all in this blog post. Other people. Who knows. I have to be honest with you, it is the last line I have from Caleb that really caught my attention as I was directing my thoughts. "We ate so much sugar so we deserve this disease." It scares me that people still think that. I wish it wasn't the case, but we ALL know that this happens and the misconceptions about diabetes abound. It is so sad, it is messed up. NOBODY and I mean NOBODY deserves this disease or any other disease. When a person is diagnosed with cancer, nobody says "oh it's because you stood in front of the microwave for too long." Or maybe, if a person is lactose intolerant that the blame is assigned to the milk drinking habits of either you or a parent. Sure there are some people out there who blame cell phones and microwaves for cancer. But people tend to write that misinformation off. Yet for diabetes, people are more than willing to subscribe to any urban legend/myth as to what the cause of the illness is. More so, it was because of a lifestyle of bad eating or feeding that led us to have this illness. To my knowledge the causes just like the cure have yet to be completely found. Yes, interesting tidbits have come up to link bits and pieces of the why. Don't ask me what, I forget. Yet people still parrot the same things time and time again. For once in my life I wouldn't mind if after telling someone I had type-1 diabetes that their response to me, was something like... "Oh you got it from playing with unicorns as a kid." 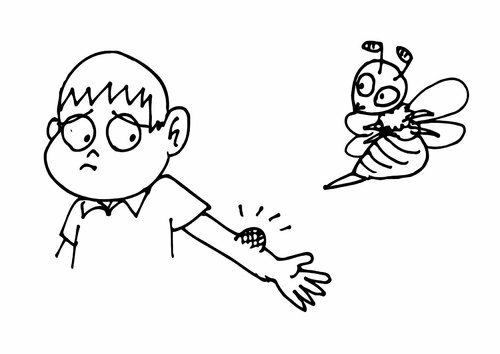 or maybe "Yeah, my mother got it from a bee sting." Something different, not the same stereotypes. Here comes the diaBEEtus... OMG, I just fell off my chair laughing again. Not the cause or case. Yet people just don't know or get it. It pains me and saddens me. Yet again, the comment of "we deserve the disease." This idea or concept that Caleb has been told or heard from idiots is so sad. We do not deserve this disease on any level. Yet it can happen to the best or worst of us. The thing is, we can survive, we can do this. You know what we can do this. Yet it would be "easier" if we did not have to answer those same questions again and again. This is why I want my button. Especially the hammer function. Hey look - It's Caleb's mom showing off her dance moves at the FFL banquet! And I know she really likes this picture too!